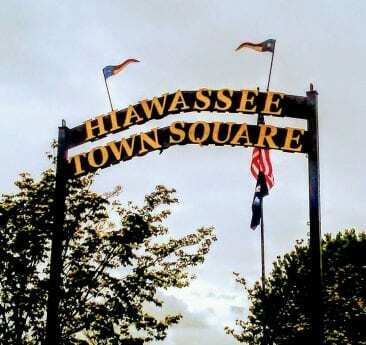 HIAWASSEE, Ga. – Hiawassee Town Square, a focal point in the heart of the city, is in the process of transformation. 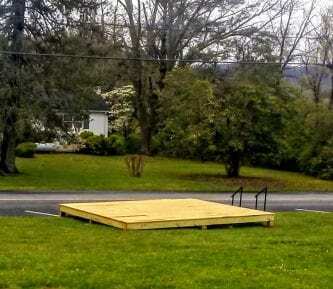 In addition to the newly installed Appalachian Trail kiosk, a platform stage has been constructed on the Square’s southern border in anticipation of plans in the making. The annual season of “Enchanted Music on the Square” begins on May 26 at 6:30 p.m. and continues each Saturday evening throughout the summer months. Hiawassee Mayor Liz Ordiales announced the addition of a new event, “Flicks on the Square”, with movies projected on Friday nights after dark. While the bi-monthly occasion will be aimed at attracting families with children, the possibility of a classic movie or two for an older audience exists. The first showing is expected on May 25, on the Friday of Memorial Day weekend. The mayor went onto say she hopes the cost of the movies themselves will be sponsored by local businesses or organizations. Unfortunately, the progress on the Square also includes the removal of a maple tree which stands beside the trail kiosk, next to the newly-added picnic tables. Mayor Ordiales says she spoke with an arbor expert who inspected the maple, deeming it demised. 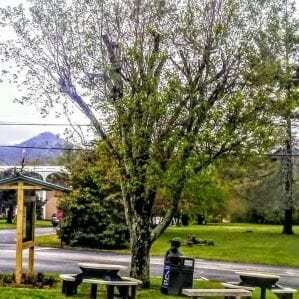 Hollow areas throughout the limbs were said to have been discovered during the trimming process, and due to liability concerns noted by Hiawassee City Attorney Thomas Mitchell, the tree must go. A sugar maple tree is expected to be planted in its place.